The Vizsla breed, named for the Hungarian word meaning “pointer”, is a hunting and sporting dog with a history that is estimated to go back 1,000 years or more. It is believed that the Vizsla’s ancestors travelled with the Magyar people as they conquered and settled what is now considered Hungary in the 9th century A.D. The Magyar needed a dog that was capable of pointing and retrieving birds, but fast enough to track larger mammals on the hunt. By the 18th century the modern Vizsla breed was firmly established, popular with Hungarian barons and warlords. Prized for their hunting abilities, the Vizsla remained popular in Hungary until World War I, when it was nearly eradicated. Breed stocks were barely replenished during the interwar period, only to be imperiled again when the Russian army invaded Hungary during World War II. This invasion was both a curse and a blessing for the Vizsla. On the one hand, invasion resulted in countless deaths of both Vizsla and their Hungarian owners. On the other hand, the Russian invasion was the impetus for the spread of the Vizsla breed, as owners fleeing the Russian invasion brought the breed with them when they emigrated to other countries. The first Vizslas came to America in the early 1950’s. Their numbers surged on this side of the Atlantic as increasing amounts of Hungarian refugees resettled here at the beginning of the Cold War. The Vizsla breed was first recognized by the AKC in 1960, and has since remained a popular hunting, sporting, and family dog in the United States. Prized for their hunting abilities, the Vizsla remained popular in Hungary until World War I, when it was nearly eradicated. Breed stocks were barely replenished during the interwar period, only to be imperiled again when the Russian army invaded Hungary during World War II. This invasion was both a curse and a blessing for the Vizsla. On the one hand, invasion resulted in countless deaths of both Vizsla and their Hungarian owners. On the other hand, the Russian invasion was the impetus for the spread of the Vizsla breed, as owners fleeing the Russian invasion brought the breed with them when they emigrated to other countries. The first Vizslas came to America in the early 1950’s. Their numbers surged on this side of the Atlantic as increasing amounts of Hungarian refugees resettled here at the beginning of the Cold War. The Vizsla breed was first recognized by the AKC in 1960, and has since remained a popular hunting, sporting, and family dog in the United States. The Vizsla has a number of distinguishing features that set it apart from other breeds. They are a short haired, medium sized breed that stands between 21-24” tall, and weighs 45-65lbs. They are an incredibly fast, active breed that excels on the hunt. Whether flushing out birds or tracking game, the Vizsla is most at home outdoors. Unlike some hunting dogs, however, the Vizsla is content to curl up next to their owner on the couch at the end of a long day. 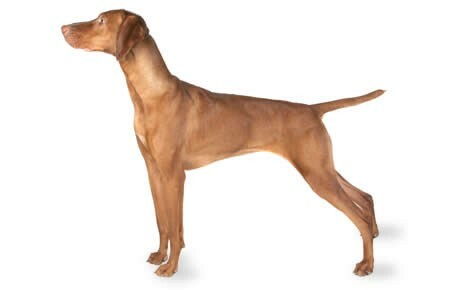 Also unlike nearly any other breed, the Vizsla’s coat comes in only one color; solid golden rust brown. Their short-haired coat is exceedingly beautiful, and one of the most distinguishing Vizsla characteristics. Vizslas are also known to exude almost no smell. They are a very clean breed that grooms themselves similarly to a cat. Their similarities to a cat do not end there. Vizslas also have cat-like feet with large exposed nails. The Vizsla is truly a unique breed that has won the hearts of many families all over the world. The Vizsla is widely regarded as an excellent all-around breed. They are an extremely active breed, so they will need to spend a lot of time with their owner outdoors. As such, they are not suited for urban or apartment living. The Vizsla thrives with wide open spaces and room to move. While a Vizsla will be quite content running, hunting, or training alongside their owner all day, they are also a gentle and sensitive breed that is extremely affectionate with their family. They are known to love and cuddle after a long day. They are not a breed that should be left outside at night, as they will become lonely if they are not close to their owner. Owning a Vizsla truly results in an additional member of the family. Like any other family member, they will require care, attention, and love in order to thrive. Vizslas are not the easiest breed to train, nor are they the most difficult. To pick up new commands, they will require repetition and patience during training. Once they learn commands, however, they are very well behaved dogs. It is recommended to begin training your Vizsla puppy as soon as you get them home, and expect to spend a significant amount of time doing so. Vizslas can be stubborn and willful at times, which accounts for the difficulty some owners have in training them. The Vizsla’s sensitive temperament makes training based on positive reinforcement the best option. They love to please their owners, and can take scolding or negative feedback personally. A Vizsla has very high exercise demands due to their extremely high energy levels. A short walk around the block will not suffice to keep this breed content. Expect to take your Vizsla out on a vigorous run or strenuous exercise session daily. A Vizsla will be quite content to run for hours alongside their owner, and even then may expect a play session at the end. They excel at retrieving, so a long bout of fetch in a large park or field will suit them well. For owners that don’t have the time or energy level to meet these high exercise demands, the Vizsla is probably not the breed for you. A healthy breed, a Vizsla life expectancy is relatively long. With no serious health complications, expect your Vizsla lifespan to range anywhere between 10-14 years. The Vizsla is currently the 31st most popular AKC registered dog breed. This level of popularity is probably the result of a combination of factors. They are family dogs with a loving and affectionate personality, but they require such a large amount of exercise that they are not suitable for every home. Additionally, Vizslas thrive in rural or outdoor environments. Owners who live in cities or suburbs often cannot provide the environment or care that a Vizsla needs. Vizslas are a high-energy breed that needs high-quality food in order to thrive. Look for a food that provides balanced nutrition including good quality proteins, non-grain carbs, and healthy fats. Avoid grain fillers such as soy, wheat, and corn as these result in foods that will require your Vizsla to eat more to reach satiety, while also being harder to digest, which can even lead to allergies in some dogs. The Vizsla has very low grooming requirements. Their short-haired coat will need brushing about once a week to remove dead hair. They are an almost odor free breed that grooms themselves constantly, so they only need baths occasionally. Be sure to keep their nails trimmed as they tend to be longer than many other breeds. Are Vizslas Good with Children? Vizsla’s are known to be great with children of all ages. As with any breed, it is recommended to supervise play with very young children. However, Vizslas show no aggression towards children, whether strangers or family members. They have the energy levels to keep up with, and surpass, even the most energetic children. They will tirelessly play fetch with a child, and then curl up alongside them for a nap. Hip Dysplasia: Vizslas are particularly prone towards developing hip dysplasia and should be tested by a veterinarian early to determine if they exhibit laxity in the hips. Hip dysplasia is a condition that can affect nearly all dog breeds. This Vizsla health problem is the result of a malformation in the connection between the femur and the pelvic girdle. This malformation results in a loose connection that causes uneven wear on the cartilage that pads both bones. Over time, as this cartilage wears down, scar tissue and bone spurs can occur. Hip dysplasia typically presents in younger dogs as a loose hip assembly and can be assessed from a young age through a physical examination by a veterinarian. In older dogs, the damage caused by hip dysplasia results in painful arthritis, inhibited movement, and eventually lameness. Lymphosarcoma: Lymphosarcoma is a malignant cancer that affects the lymph system in dogs. Specifically, the cancer affects a white blood cell called a lymphocyte that is the major cell found in the lymph system. Normal, healthy lymphocytes are part of the bodies immune system, and are responsible for fighting infections or disease. When a lymphocyte turns cancerous it begins to attack normal, healthy tissue. Although lymphosarcoma can appear anywhere within the lymph system, the most general early symptom of lymphoma is a hardening and swelling of the lymph nodes. Once these cancerous cells begin to replicate, they spread throughout the lymph system. As the condition progresses, internal organs such as the liver and spleen, as well as bone marrow, can be affected. Lymphosarcoma is most often treated with chemotherapy, due to the spread of cancerous cells throughout the body. In most cases, chemotherapy is extremely successful and drives the cancer into remission for a period of time. However, many dogs experience a resurgence of lymphosarcoma and must undergo chemotherapy again. Epilepsy: Epilepsy is a condition that is characterized by repeated seizures. These seizures can either be a symptom of an underlying medical condition, or symptomatic epilepsy, or be occurring in the absence of any underlying medical condition, known as idiopathic epilepsy. In either case, most dogs suffer from what is known as tonic-clonic seizures, or seizures that result in full body motor movement such as thrashing of legs and are accompanied by a loss of consciousness. Following a seizure most dogs will experience a period of mental fatigue and may appear sluggish. For cases of symptomatic epilepsy, the condition is addressed by treating the underlying medical condition for which seizures are a symptom. In cases of idiopathic epilepsy there is no definitive treatment available. Because seizures can be a symptom of an underlying medical condition, be sure to consult with a veterinarian if you believe your Vizsla has suffered from a seizure. Progressive Retinal Atrophy (PRA): PRA is a degenerative disease that affects the retina of the eye in dogs. The retina contains photoreceptor cells responsible for the eye’s ability to receive and perceive light. With PRA, these photoreceptor cells deteriorate over time. The most common early sign of PRA is a diminished capacity to distinguish objects in low light. Your Vizsla may have trouble playing fetch at dawn or dusk, or may bump into things at night. Over time this condition progresses to full loss of vision. PRA is a hereditary disease, so be sure to check with your breeder prior to adoption to determine if PRA runs in their line. Cataracts: Cataracts are another hereditary condition affecting the eyes that commonly occurs in many dog breeds. This disease affects the lens of the eye, resulting in the lens turning cloudy or opaque over time. At very early stages, cataracts will not affect the ability of the eye to see. However, as the disease progresses it will result in diminished or even full loss of vision. Cataracts are most often treated through surgery with very high success rates. However, to maximize the chances of success it is important to catch cataracts early. Make sure to visually inspect the eyes of your Vizsla for any cloudiness during any grooming session. national breed website: The Vizsla Club of America, Inc.